At the beginning of 1914, my grandparents had important decisions to make. My grandfather, Lewis Casson, 38 years old, had just resigned from an important job as producer (the more usual word for a theatre director) at the very first regional repertory company in England, Miss Horniman’s Company at the Gaiety Theatre, Manchester. His modern production of Shakespeare’s Julius Caesar had not been to Miss Horniman’s taste and a furious row had ensued. She cancelled his next production of The Tempest, which was to be equally avant-garde, and he felt that their ways must part. For seven years, the Gaiety had been the centre of his life. 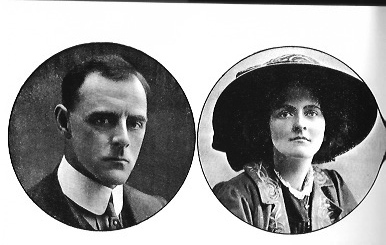 While touring in Ireland as a member of the company he had first met Sybil Thorndike. They had married in 1908, set up their first home in Manchester and now had two sons, and another baby on the way. Sybil had developed her acting to a high standard, both in naturalistic plays of what became known as the ‘Manchester school’, and in Shakespeare and Greek tragedy. They were ready to take the next step in their theatrical careers; Lewis was deeply involved in plans to create a National Theatre in London that would present the very best of British drama, presented to the highest possible standards. They were also aware of the great developments in theatre taking place in Europe, and started planning a trip that would take them to Berlin, Munich, Moscow and other centres of the new art theatre movement. Sybil took up residence in Westminster, in a house her mother had bought, and there, on a beautiful sunny May morning, she gave birth to her first daughter, Mary, my mother. ‘One of the happiest days of my life’ Sybil used to say. Lewis took the boys to Dymchurch on the Kent coast, where they were soon joined by Sybil and the baby. He did various minor productions which left him plenty of long weekends with the family, bathing, teaching the boys to swim, helping them to build sandcastles, and when they ran off to buy sticky buns, he and Sybil sat on the sea wall building their own castles in the air as they gazed out to sea. They were in Dymchurch when the Archduke Ferdinand was assassinated. In July, Lewis stood on the beach and voiced his conviction ‘There’s going to be a war in Europe’. ‘Thank God you’re not a soldier then,’ said Sybil. How fascinating to read about Lewis Casson’s difficulties as a young theatre producer in 1914, and his and Sybil’s family life at the time of the outbreak of WW1.I don’t know how Sybil managed to combine her acting with her responsibilities as the mother of three young children. What a wonderful picture of her in that great big hat!